But, of course, I DO have more to say. Because you, dear Fidgety Reader, deserve to know why I love these socks. The pattern and the yarn go hand-in-hand. Sort of. The yarn was purchased in 2016 during the Minnesota Yarn Shop Hop. The theme that year was literature and was amazingly all over the board (Great Gatsby, a romance novel, Winnie the Pooh) and provided for some beautiful yarn dyed to match a pattern connected to each shop’s book choice. This pattern was created for the Shel Silverstein poem, The Unicorn. I loved Shel Silverstein when I was in elementary school and this poem was one of my favorites (because, seriously, elementary-aged girl. Unicorns. No brainer). One of the neat things about the Hop was the opportunity to visit yarn shops in cities a distance from my own. After visiting Twisted Loop Yarn Shop, I wish this place was closer to my home. The shop is tucked in an alcove in the entry way of a library. Because space is finite, owner Jenni (seriously, it’s like the universe needed me there) has done a beautiful job of curating a small but spectacular collection of yarn and notions. By the time my husband and I made it to the shop, we were near the end of our list and the original colorway of the yarn was gone. But the owner made sure there was other yarns in beautiful colors by the same company available for purchase. First, the pattern, The Unicorn Sock. This was super fun to knit and simple. Toe up, swirl feature, done. 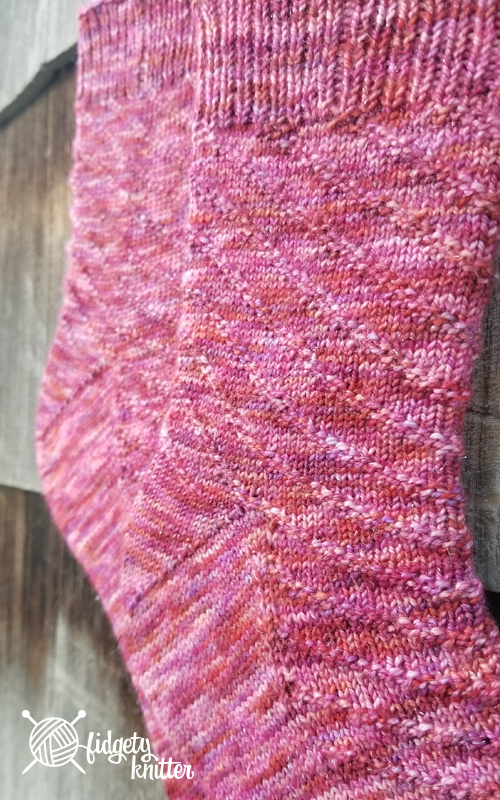 If you look very close, there are one or two places where I put a purl in the wrong place (and I mis-counted going from heel to ankle and my swirl is shifted two stitches but it doesn’t matter. When these are on my feet, all you notice is the cool swirl. It’s a repeating eight-row pattern and is pretty easy to memorize. I kept my pattern with me, but really only as a safety blanket. Unfortunately, because this was a special pattern for the Hop, I can’t seem to find it online. I’m really sorry that you won’t be able to knit these amazing socks. Now let me talk about this yarn. It’s a bittersweet yarn for me. This yarn was a dream to knit with. The color is beautiful (and she has a solid science fiction tie to each yarn. This skein was called, Assparkilate in Lip Service). The yarn is a superwash merino wool/nylon/stellina blend and didn’t pill through knitting, washing and wearing. Also, there are sparkles—SPARKLES—throughout. I can’t capture the amazingness of the sparkles in any pictures, but trust me, there are sparkle-riffic. I would have purchased many a skein during my Hop stop but I had a cap on what I could spend at each store. As I went to find the online shop to link to my Ravelry pattern when I cast on, I found out the dyer had passed away. This is especially sad because she was quite young. While I was knitting with this fantastic yarn, every time I stopped to admire the yarn, I thought of her passing. I understood from the shop owner that Maegan of The Cyborg’s Craft Room was a lovely person. When they ran out of the yarn intended to go with the Unicorn sock, Maegan brought out more. It wasn’t the same color, but she brought enough to overflow the table. That’s something not every dyer would do. So while I would most certainly purchase more of this yarn, I’m not sure that I would find much available. 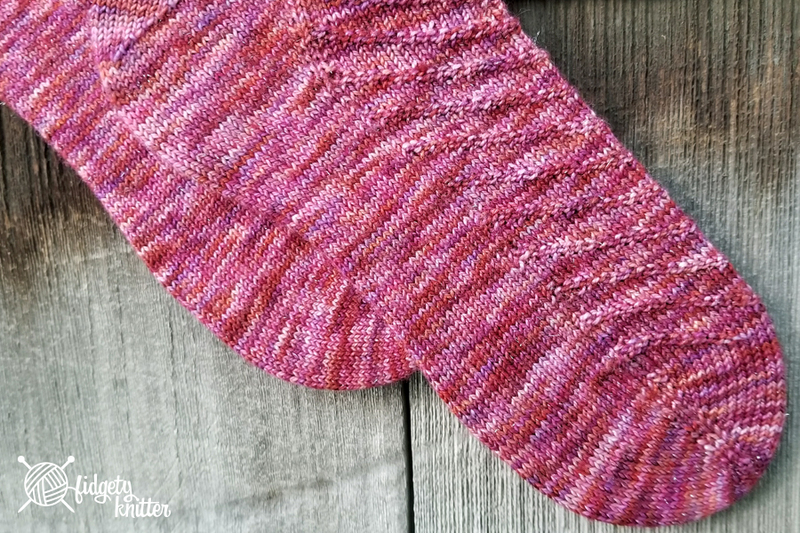 The end result of this seems to be that I made a pair of socks that I absolutely adore in a pattern that you can’t get with a yarn that you probably won’t be able to find. At least I know you’ll be able to find the US 1.5 needles I knit these on, right? 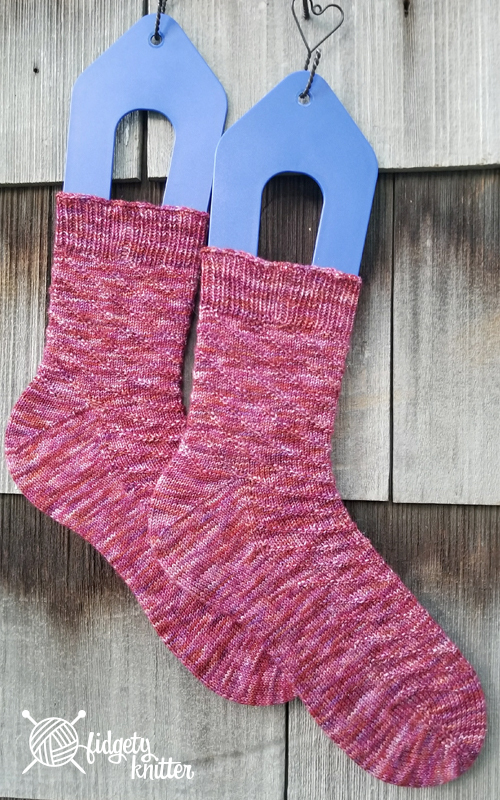 If, by chance, you are able to find the yarn and the pattern though, these are awesome socks that you should really be knitting. What’s your current favorite finished project? Let me know in the comments (and don’t forget to include a link if you have one. Unlike me and this awesome pattern).